Today I made a very good sour cream coffee cake using a recipe from the second private collection (dated 1984) of the ladies of the Palo Alto Junior League. I didn’t take any shortcuts but I did make some minor adjustments. 1) I used European style salted butter. The recipe calls for “butter” and I took that to mean salted. Use unsalted if you want, but you might need to add a litte extra salt to the batter. 2) increased the vanilla from 1/2 teaspoon to a good teaspoonful. 3) toasted the walnut pieces in a skillet then let them cool completely before mixing them with the streusel. I also used a tad more…about 2/3 cup total. What we noticed about this cake was its incredibly light texture. The sifted cake flour is key, so make sure you sift. 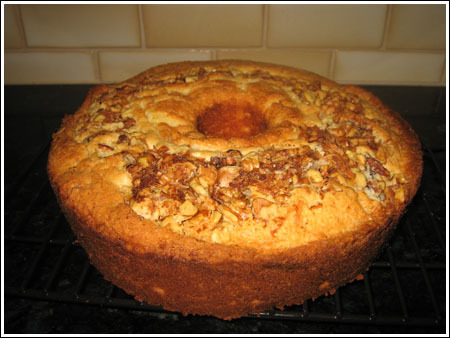 If you enjoy this cake, or round coffee cakes in general, here’s another fun pan. I have my eye on this one, but am using my regular (taller) tube pan for now. Here’s the recipe. It’s the same recipe as the one in the book, but I reordered the ingredients and changed the wording to match the way I did things. All credit goes to the lovely ladies of the Palo Alto Junior League, of course. Junior League of Palo Alto Sour Cream Coffee Cake made with sour cream, cinnamon and nuts. Preheat oven to 350 degrees F. Grease and flour a 10 inch tube pan. Prepare nut mixture first. Stir together nuts, brown sugar and cinnamon. Set aside. Sift together the already-sifted cake flour, baking powder and salt and set the flour mixture aside. In a large mixing bowl, cream the butter and sugar using high speed of an electric mixer for about 2 minutes. Add the eggs one at a time, beating for 30 seconds after each egg. Beat in the vanilla, then fold in the sour cream. Add the flour mixture and stir with a mixing spoon (do not beat) into the batter, mixing until incorporated. Spoon about half of the batter into the greased/sprayed pan, then sprinkle a light ring of nut mixture over the batter. Spoon remaining batter over ring, then spoon remaining topping decoratively over top. Bake for 50 minutes to an hour. The Junior League baked theirs for one hour, but mine was most definitely done in 50 minutes. Let cool for 10 minutes in pan. Remove from pan by inverting onto a flat dish, then inverting again onto a rack to finish cooling. When you are ready to serve it, you can transfer it to a nice plate.